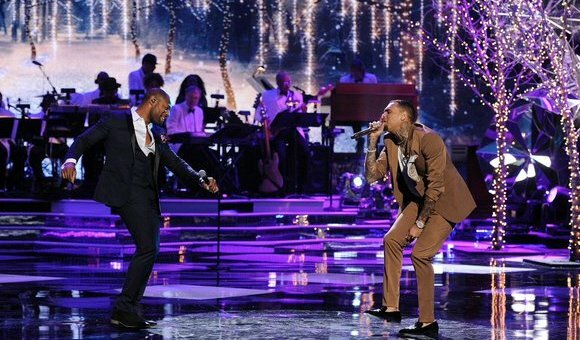 Last night, Chris Brown performed on Taraji and Terrence's 'White Hot Holidays' special on Fox and shocked fans with his poor vocals. He was hitting nothing but struggle notes during that performance of 'This Christmas.' And then, what made things worse is that a REAL VOCALIST like Tank comes on stage and embarrasses him even more. It's like Aretha Franklin joining Britney Spears on stage for a duet. Things that are NEVER suppose to happen, lol. He received a roasting on social media, prompting him to defend himself. He claims that his poor performance was due to bad health and that his idol Michael Jackson didn't score 50 every night. Well I don't recall MJ sounding that bad in a live performance ever. If he was ill, he should not have performed.